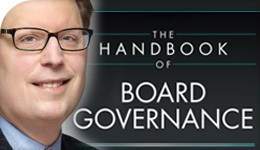 Administrative Studies Professor Richard Leblanc, from the Faculty of Liberal Arts & Professional Studies (LA&PS), delivers expert advice on corporate governance in his new edited collection, The Handbook of Board Governance: A Comprehensive Guide for Public, Private, and Not-for-Profit Board Members. The book is geared toward corporate directors and is also selling to secretaries, reporting management and advisors to boards. The collection’s authors hail from a variety backgrounds, including profession, gender, ethnicity, age and geographical diversity. They represent eight countries. The youngest author is a 20-year-old Harvard student and the oldest is in his eighties. Leblanc, in addition to editing the handbook, authored two chapters, which address board and individual director independence, competency, behaviour, dynamics and effectiveness. The handbook also addresses assurance and includes chapters that cover governance of family businesses, not-for-profits, private companies, start-ups, the Middle East and Northern Africa.